A couple of months ago I went on a two night camping trip with some friends. I love pretty much any time spent in the woods, but car camping meant one very important thing: I could bring anything I wanted! Backpacking is awesome, but having to carry everything on your back can lead to either leaving some things at home, or regretting all of the luxury items weighing you down for the whole trip. Because we were car camping, the first thing I thought of was how much food I could bring, naturally. I mean, I am a vegan. It’s what we do. 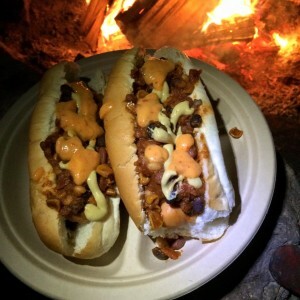 One of my favorite camping meals is chili dogs. But this time, they were to be even more epic because the lovely Ilsa of Nacheez Dairy-Free Nacho Sauce had sent me some free packets to try out! 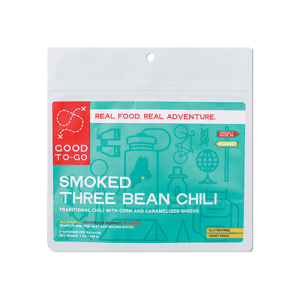 I’d also be using my absolute favorite chili for camp chili dogs, the Smoked Three Bean Chili from Good To-Go, a company in Maine that makes gourmet dehydrated foods. So much better than the freeze dried stuff! My stomach is rumbling just thinking about it, so let’s get to it! 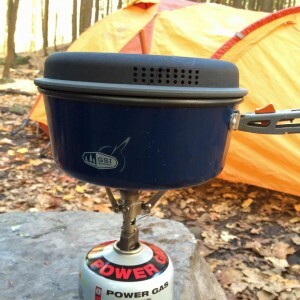 I set up my camp stove and got to boiling some water. Good To-Go is super easy. Just add the boiling water to the food pouch, stir it up and let it sit for 20 minutes. This is a lot longer than many freeze dried meals, so you’ve got to plan ahead instead of waiting until you’re already hungry. But believe me, it’s well worth the wait when you take that first bite and realize that you’re eating real food. I cooked up some Lightlife Jumbo Smart Dogs on the stove while I waited for the chili. Pop them in some buns, top with some brown mustard and the chili. And now for the ingredient that made these the most epic chili dogs I’ve ever had. Here’s a shot of the finished product. Are you drooling yet? Nacheez comes in mild, medium and spicy. I used the medium and just drizzled it over the top of the chili dogs. It’s so deliciously cheezy, with just the right amount of spice. A perfect addition to my favorite camp dinner. … I’m thinking nachos for my next movie night at home. Yummm. Oh wait, I did have dessert that night, too. 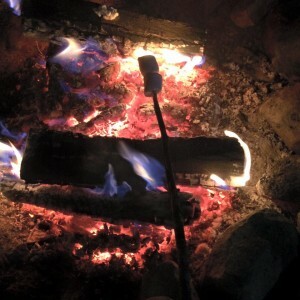 What’s a camping trip without S’mores made with Dandies vegan marshmallows? Now it’s your turn. What’s your favorite vegan car camping meal? Leave a comment below!